Federal Information Minister Fawad Chaudhry, having declared the travel expenses of Nawaz Sharifs' children to be in the billions, announced on Friday that a notification to recover the amount would be sent to Hassan, Hussain and Maryam Nawaz. During a press conference held in Islamabad alongside Pakistan Tehreek-i-Insaf (PTI) Senator Muhammad Azam Khan Swati, Chaudhry said that Nawaz and his family's travel expenses ran in the billions. However, since Nawaz himself had prime ministerial privileges, the matter of his own expenses will be dealt with later, he added. 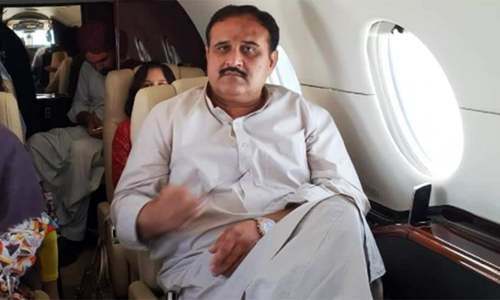 The information minister alleged that Hasan, Hussain and Maryam Nawaz had misused state funds and travelled illegally in two private planes and a helicopter. The use of two private jets, namely the G4 and G450, cost the state to the tune of Rs17.15 million. These jets were used by the ousted prime minister's children in his absence and for no state-related affairs, to travel in between their Jati Umra residence, Lahore and other locations. Chaudhry said that the use of the helicopter has been calculated separately, adding that Hamza Shahbaz and others misused the Punjab government copter. The costs incurred by Nawaz's children over the use of the copter were found to be Rs6.23 million. He revealed that details of these illegal expenditures were recovered from a log book and that the total bill amounts to around Rs25 million which will be sent to Nawaz Sharif for recovery, and that a notification of the same will be sent to his children. 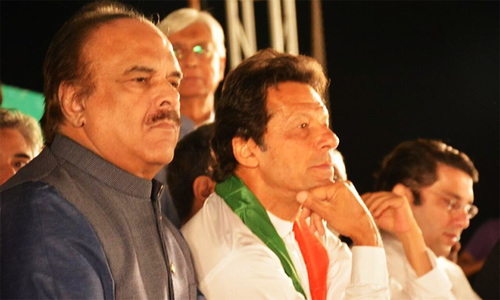 Situationer: Austerity drive — but at what cost? He can add that Rs25 million to the lawyers' fees he owes. I think there is a Zero missing in the calculatuons. IT must be at least Rs 250 million over the past three terms in office that the family exploited and lived off tax-payer's expense for their first-class travels and pampering. Why Nawaz Sharif. Send it to his children who are adults. This clearly seems to be vendetta against Nawaz therefore his name has been broadcasted. What about current Punjab CM and his family travelling in helicopter for fun trips. I think use of copter was the most economical and most convenient mean of transportation PTI and their supporters were trying to convince the nation from last so many days? Why copter is justified and cost less when IK is on board and it is unjustified and costs more when someone else use it ? Recently Punjab CM traveled with his family in a helicopter, did he pay the bill for his family? Yeah send him the bill, and recover the amount within 7 days. Are the helicopter use calculations based on Rs.54/km or most realistic number. Please share the calculation with public to see if the billing is fare. 6.23 million divided by 55 Rs per kilometer (as per Chaudhry's previous statement) is over 1 lac kilometers. That is a lot, and highly unlikely. When will the government recover money from other big fishes like Dr Asim and Sherjeel Memon amounting to billions of rupees especially when Dr Asim's confession is on record! PTI will not go anywhere with this type of revenge politics. According to PTI only Nawaz Sharif is corrupt in the entire Pakistan. That's not enough. Get every penny out of them! At the rate of Rs. 55 per km. How can helicopter travel cost that much. it is the cheapest mode of commute in the world. So how many kilometers he used at rate of Rs. 55 per kilometer? couldnt have expected this off any other government . Keep it PTI . @Rs.50 per km - the cost of riding a km in a chopper as estimated the other day by the info minister, the Sharif family must have flown 500000 km to justify a Rs.25 million bill!! Well done! Recover every penny. 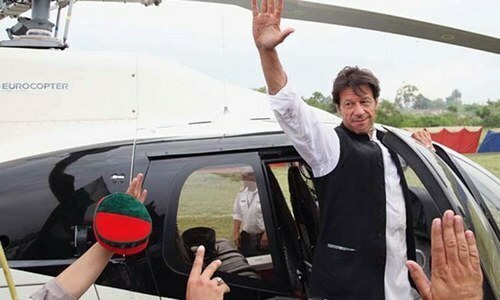 although it appears to be a counterpoise to the controversy prompted by imran khan's use of helicopter for commuting, nevertheless,it is useful to see the present rich ruling elite and their predecessors expose each other. it is merely "holier than thou" situation. lets wait and see what else comes into public domain. Government is barely 14 days old and to start to get after former PM and his family does not show present government in good taste. Is this the main agenda of this government ? I am not saying don't probe NS. By all means should be done , but this action look like being PRIORITY one of the present government. Are you also asking the CM Punjab to reimburse expenses for his personal helicopter joy rides? I think you are billing him too high. 55 rs per litre should not exceed 3 to 4 million for his whole tenure. You know that this is not recoverable. So stop wasting Sate time with these kinds of announcements. Unless, of course, you want 'brownie points'. If you have a case, which I think you have, then file a civil case an follow it through the normal channels. And let the nation when you have recovered the money. When ur billing IK for using KP helicopter? Do something constructive if you have ascended the high pedestal. Why not charge them Rs 50 per km as applicable to Prime Minister Imran Khan. If he thinks it cost 55R for helicopter ride then Billion for NS does looks very doggy ! Here we go! Proper accountability of our ex dishonest leaders. They must pay all illegal travel expenses. So the political victimization started! Its seems PTI is still in opposition mood. Why just Nawaz what about all the rulers before him? Or PTI just hates Nawaz? Interesting cost of the helicopters appear to be higher than what IK currently pays! Well, sending the bill to Nawaz Sharif and Maryam would be easy, we all know their current, inshaAllah permanent, address. But the Sharif sons would be an issue as they are on the run. What i can guarantee is the more we dig, the more expensives would appear. Sharif family used Pakistan's treasury like their own personal wallet. Just see how arrogant Nawaz family will spend more money on lawyers to defend themselves rather accept their mistakes and return the money to government. Great. Pakistan need all rupees to reduce circular debt and finance other project. So when Nawaz travels by Helicopter it costs 25 million, whereas when Imran goes by Helicopter it costs only Rs. 55? How did 55rupees per kilometer copter rack up 6 million bill? It's not minister's job to announce recoveries. Finance ministry should order recovery of all unpaid or misused dues, not only by the ex PM's family but all people who had access on my tax money and let relevant departments do it. Please don't make it political. Yes, former PM Nawaz Sharif should be billed for his personal travel expenses, which he had dumped on the tax payer. In no other democratic country would such abuse of office be allowed, he would have had to pay or go to prison. The people of Pakistan demand accountability of all those holding public office. No politician or his family can be above the law. Lets see the Sharifs pay for their theft. Very good. Nawaz Shariff so rich and abusing his position to give free travel expense to his kids. There are poor kids in Pakistan who don't even get one proper meal a day and we have the likes of Nawaz Shariff spending millions of country's money on his family. Now we know why the country is in the dog house? Best of luck Fawad Chaudary, reclaim every penny from those who looted our country. Throw in tips for pilots and other air staff, too. Set a precedent for any future looters. Good stuff. Are you charging them at the rate of Rs 55 per kilometre or a different rate applies to them? Great. Get what ever you can form these criminals. PTI can't even think beyond Nawaz Sharif... He's in jail serving a 10 year sentence yet the first thing they discussed in the first cabinet meeting was putting his name on ECL. I wish they would go after Gen. Musharaf with the same dedication. Cannot believe he could such a pathetic excuse. So is he never going to travel by road. This explains that the RTS servers were stopped delibrately by noon friends when they realized that pti is winning so than later they can declare elections contraversial. They failed. Excellent decision to recover travel costs incurred by the state on travel of ex PM's children. A precedent needs to set which would deter others from such illegal practices. Fawad Chaudhry Sahib Rs.25m is a very7 small amount - please recount, it should be triple of this amount. Now the million rupee question is, was former PM remained Sadiq & Ameen in the light of above fact(s)? Those expenditures on joy rides (children not being part of government executive branch of higher status) could have been easily spent on children’s education and medical needs who are lacking terribly. Government must audit each each crook of past administrations and punish per laws of the land. Mr Chaudhry first prove your own worth and then hold others accountable. I would like to see the details of the fares just to see if it is charged fairly. Do we not want transparency? The same Minister only last week said the helicopter used by Imran to shuttle between his house in Bani Gala and the PM's House cost Rs 55/ km. During Nawaz 's tenure the ruppee was 23% stronger and the main cost of flying being the fuel, which is bought in dollars, hence the flying cost would be even cheaper ( per passenger cost almost approaching the cost of a taxi, just about) . So how did he calculate Rs 25 million. This equates to almost half million kilometers @ Rs 50/ km. Either some in lying, or someone needs to go back to 5th grade and learn to count. This government is a complete failure, and the way they are going, soon there will be riots on street against this government of gladiators. The credibility of our Ministers who keep lying habitually is not very high. I just cannot understand the maths which came up with 25 million rupees figure. Vendetta formula must have been used as a variable. @Bitter truth "But a helicopter costs about Rs.55/km " For a PM, not for his family. @Majid "Now please start focusing on the real issues,,," They are. It is the real issue: misuse of public money. @Akhtar Husain "Why not charge them Rs 50 per km as applicable to Prime Minister Imran Khan." No one agreed that it cost 50/km, now the same don't agree that it cost this much. Imran Khan needs to explore other methods of getting back at Nawaz rather than petty issues which are so obviously vindictive. I feel this is a good step, yes a personal vendetta on by my and people of Pakistan behalf You can't just misuse our money like that, when Pakistan is already under threat of loans but that didn't stop Mr Nawaz and his family from tearing us down did it?